I'm always trying out new brands, since starting this little blog baby of mine I've become so obsessed open with trying out new stuff and getting out of my safety zone of the products I've used for years! My brush collection is something I am always always adding too, I still feel I'm learning so much about brushes and what ones are best for me and how I apply my make-up! I honestly feel like a total beginner sometimes! I was recently introduced to Crown Brush, a company I have heard so much about in the blogging world, cough cough... looking at you Liza! So I thought I would share with you my first impressions and thoughts of their brushes! I have 4 brushes from Crown Brush, 2 face and 2 eye, that I have been using for the past couple of weeks and I've been love love loving them! I have been using this brush for my foundation every morning. I wear either Bourjois Healthy Mix foundation or L'oreal True Match - such good coverage but not thick and heavy! I've also used it for blending my contouring (I use the Sleek contour kit). It is fab, so soft, a great size and perfect for buffing! Love a good fluffy powder brush me! This reminds me of a slightly of a smaller version of the Real Techniques Blush Brush (which I love). Perfect for adding a powder to set my foundation, bronzer and blushers! This is my current favourite brush for using with my Seventeen Instant Glow Shimmer Brick! One of Crown Brush's best sellers now! The name kind of gives it away doesn't it! I only own couple of brushes like this and they are from Zoeva. I think a fluffy crease brush is essential in a brush collection! I'm shocked that this is only £3.99 - total bargain! Probably my favourite out of these 4! Sometimes I do my make-up and think.... how the hell am I supposed to call myself a "beauty blogger" I'm pants and can't even do eyeshadow properly! This, however, has definitely made me feel a little more confident with my technique! The Blending Fluff helps you really get that soft blended look and get rid of all those horrible defined lines you can get when trying to create a smokey eye! These brushes range from £16.29 down to just £3.99. Totally worth every penny in my opinion, I really don't think you have to go out and spend £40 on a brush for it to do a good job! These are amazing quality, so affordable and the amount of choice is ridiculous... soooo. many. brushes. I feel like I've only just scratched the surface with these. 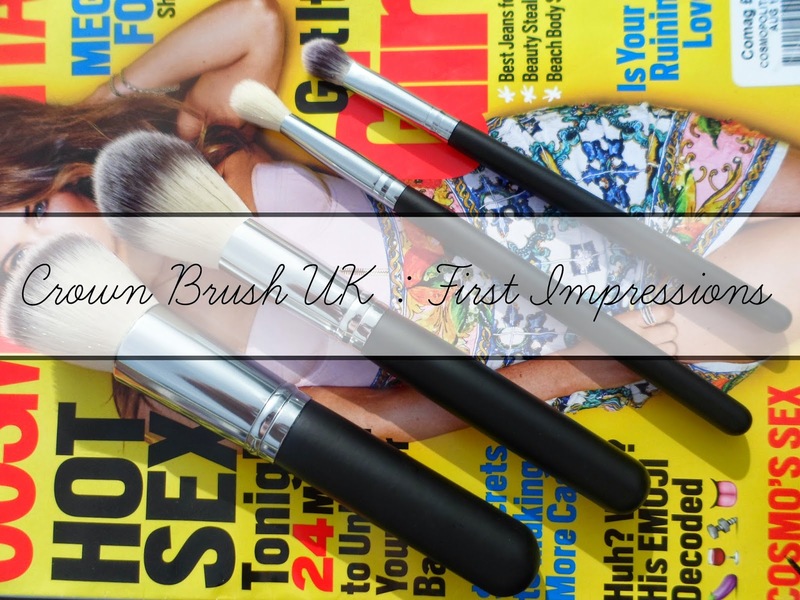 Have you tried anything from Crown Brush UK yet? Great photography and I loved the review!